The Old Co-op in Chelsea Road in the heart of Easton has 26 small office units from 100 sq ft to 350 sq ft in size. This is a much loved historic local building full of character and charm. These smaller units are always in high demand from start up businesses and single owner/proprietor businesses. Easton is a bustling inner city neighbourhood with a rich mixture of independent shops, bars and cafes selling food and products sourced from around the world. The building is supervised and inspected by the Bristol Spaceworks management team on a daily basis. Access can be arranged 24/7 and further facilities and support services are available through the reception at the Easton Business Centre. For details of the full range of services visit the What do we do? page in the About Us section. 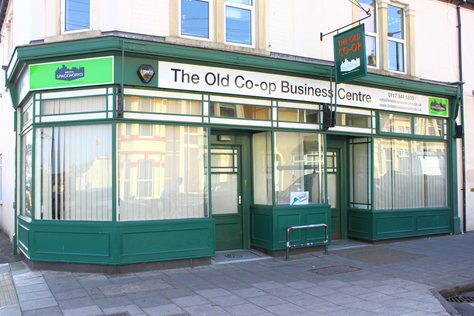 The Old Co-op, although within the heart of this busy neighbourhood is also surprisingly well connected to road links across Bristol from the M32 to the A4 Bath and A37 Wells routes. Bristol Temple Meads station is about 10 minutes drive and there are good bus routes connecting up with the city centre. For further details on the location visit the Contact Us Section. For details of current availability contact Reception at Easton Business Centre on 0117 941 5800.